4K Portrait serious businesswoman in printing factory. Crane shot panning upwards offering interesting change of background. Slow motion. 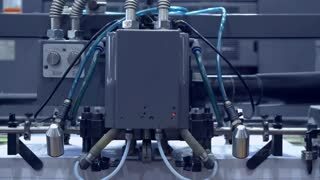 Shot of inside of a professional printer during operation. Concept: technology, printers, color. The conveyor with magazines. 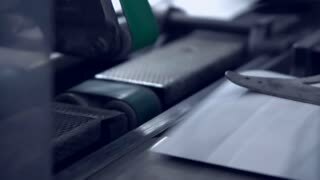 Printing factory. A stream of journal production. Data centers handle massive amounts of new data for the U.S. Government as the digital age starts in 1957. Early printers are shown. 4K Portrait happy smiling business manager in print factory with machinery & staff members in background. Slow motion. 4K Portrait smiling business manager in factory, lower management team & blue collar workers standing in background. Slow motion. 4K Portrait confident businesswoman in printing factory. Crane shot panning downwards offering interesting change of background. Slow motion. 4K Confident female business manager in print factory doing business over the phone. Slow motion. 4K Female business manager in printing factory giving instructions to an employee. Slow motion. 4K Smiling businesswoman in print factory working on computer tablet. Crane shot panning downwards offering interesting change of background. Slow motion. 4K Portrait smiling business manager in printing factory looking at documentation. Slow motion. 4K Portrait smiling businessman in factory with colleagues standing in background. Slow motion. RACK FOCUS: 3D Printers At Work In A Lab. canvas printing machine at work. 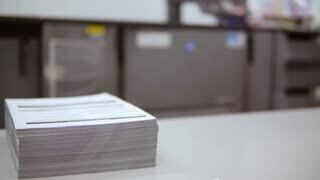 Evolis card printing machine at work. can printing machine at work. 1950s: UNITED STATES: printers in workshop. Half tone printing work. 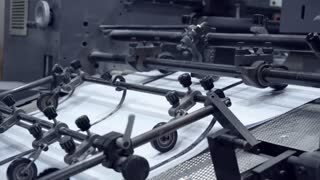 Man applies screen to printing frame. Black and white half tone printing. Four colour printing work.